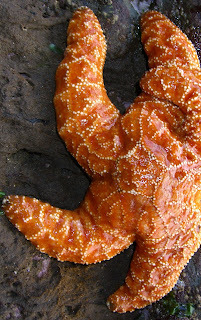 The Echinoblog: Why is Pisaster ochraceus (aka ochre star) so many colors? AKA they are what they eat! 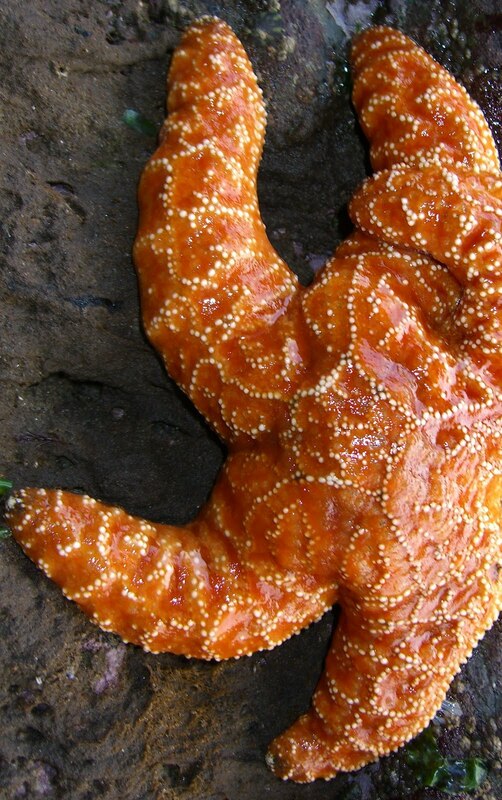 Why is Pisaster ochraceus (aka ochre star) so many colors? AKA they are what they eat! 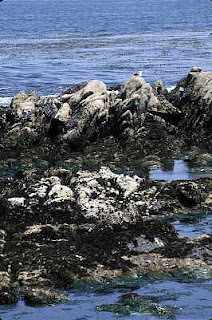 So, early in my career during my various internships and volunteer time, I spent a fair bit of time at the educational tidepools exhibits at the California Academy of Sciences and Monterey Bay Aquarium. One of the most common questions I would get about the commonly encountered "Ochre Stars" (Pisaster ochraceus) that live on the west coast of North America. Well, its taken nearly 15 years but FINALLY...I can answer this question! I thank a neat paper by Harley et al. 2006 in the Biological Bulletin, which is available via Open Access! This species lives along the coast from Alaska to California, including British Columbia, Washington, and Oregon. and... ORANGE ...and in fact, the species epithet, "ochraceus" in "Pisaster ochraceus" or the common name "Ochre Star" refers to the yellow-brown color, which was probably the living color of the the first specimens that were described of this species. Across the surveyed sites, they found that on the whole MOST of them were brown-reddish with a relative minority of orange colored members as part of the population. 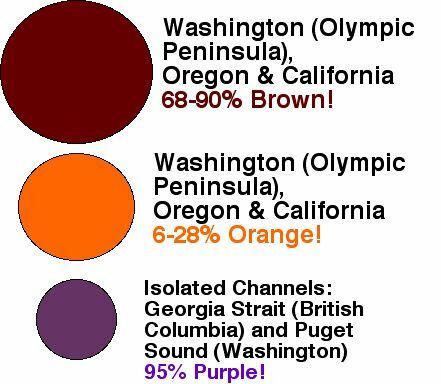 Curiously, those in certain isolated channels..in Georgia Strait (British Columbia) and Puget Sound (Washington) were 95% PURPLE!! In addition to color, they further examined other factors: food, size, and injury. And ran them together with a cluster analysis. 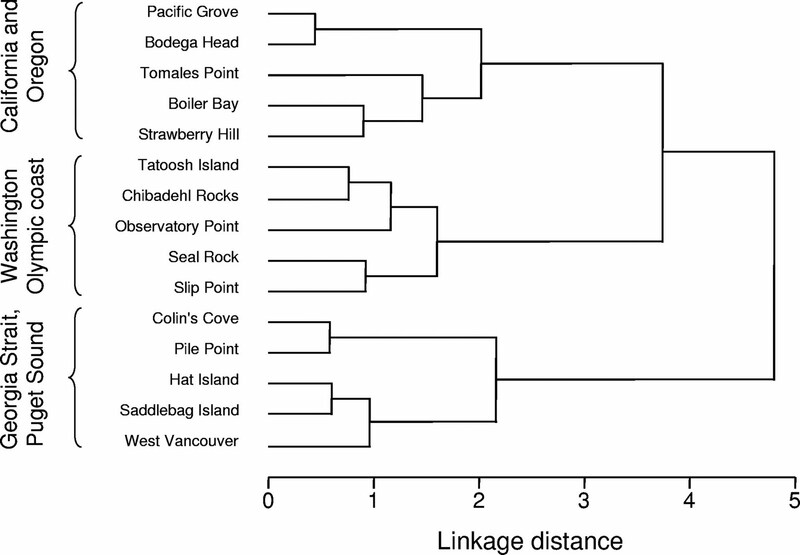 And they got a diagram that showed overall similarity between members from each of the different sampled study sites. There was a close association between all of the populations in California, Washington, and Oregon (seems like Alaska was omitted). The Georgia Strait and Puget Sound populations (the purple ones) clusters together AGAIN. COULD these purple populations be something new or different??? A logical question to ask at this point. Did this separate purple population or ANY population of this species have enough separation or structure to warrant consideration of a new species?? 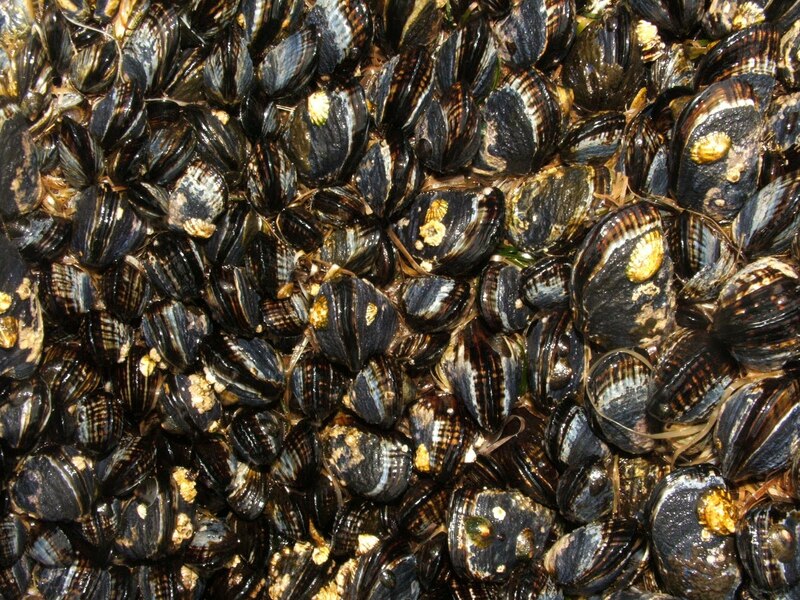 So, The study looked at population genetics of P. ochraceus. That is, the amount of genetic structure was present in the various populations within the species across its distributed range. Essentially, there was NO structure of populations across the range. They found NO "obvious" relationship between color and each population. So, to put it in much simpler terms- There is no color (or other) subset of this species that has become isolated enough that its about to become a separate species or even a genetically separated population. WHAT's going ON with the PURPLE ones then???? One of the coolest conclusions of this paper was that COLOR in P. ochraceus is probably related to what individuals of this species ATE. So, it turns out that individuals from California, Oregon, and Washington? ...and now we get to the PURPLE ones from the isolated inlets in Georgia Strait and Puget Sound. What's different about these isolated areas that's different from the open ocean populations? THEY AIN'T GOT NO MUSSELS!!! 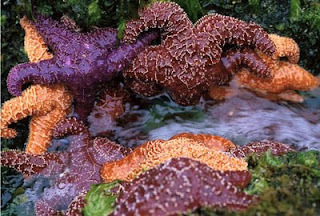 The immediate correlation seemed to be that this ecological/external effect (i.e., food type) was the reason why you get purple Pisaster ochraceus. It turns out that the mussel Mytilus contians carotenoid pigments, which are the same KIND of pigment that are responsible for the orange color in carrots!! They point out that the color still varies among individuals-some orange, some red/brown, and some in between. So, there might yet be an underlying genetic component to the variation in color. 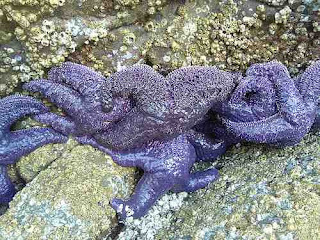 They add anecdotal accounts that some orange adults turn purple when held for long periods under laboratory conditions and that small individuals of Pisaster are actually not fixed on a color. So SIZE and maturity may also be important factors. But the authors save the best for last. They also speculate that those factors that affect color are apparently stable over relatively long ecological time scales. 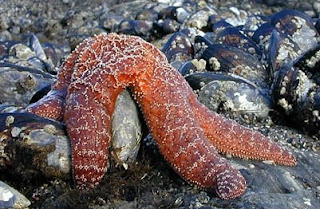 In some places, such as the famous Pacific Grove, California (home to Ed "Doc" Ricketts and Cannery Row), they were able to determine that Pisaster size, color frequency and diet have not significantly changed in over HALF a Century!!! So, this famous population of sea stars has not undergone any real changes in prey abundance for the last 60 years or so! I really want to know more about the underlying genetic components to color variation. I know that sea urchins produce a pigment called "Echinochrome," a pigment synthesized by a polyketide synthase protein. Even tiny larvae in S. purpuratus have bright red cells expressing this gene. I've always wondered whether coloration differences, particularly in the widely variable Lytechinus variegatus (another urchin) are maybe due to genetic differences in polyketide synthase or in the same biosynthesis pathway. Well..the color issue here seems species dependant. 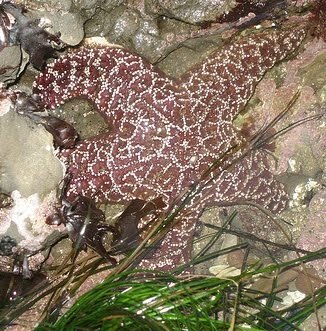 Pisaster ochraceus does this-but its not really seen in the other Pisaster species. 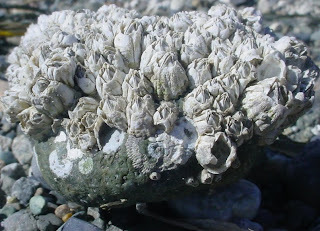 Nor is it seen in the east coast Asterias, which is also a bivalve predator (although I'm not sure if its mussels). The authors didn't really/and couldn't really elaborate on the genetic components but I look forward to the day when you (or someone) has more to serve up on the subject! OHMYGODFINALLY! This is one of those mysteries that I feel like has been floating about FOREVER with no real solid answer. I hope there's a followup experiment, just to check, but, *whew*, I'm glad there's finally something about this in the literature! I'm not sure it's this cut and dry. 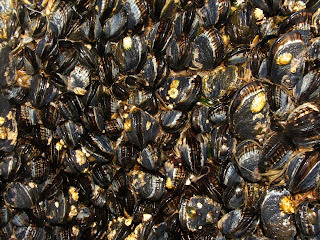 The P. ochraceus in the Georgia Strait and Puget Sound area still consume bay mussels (M. trossulus, mainly), and all Mytilus spp. pretty much have the same carotenoid pigments. 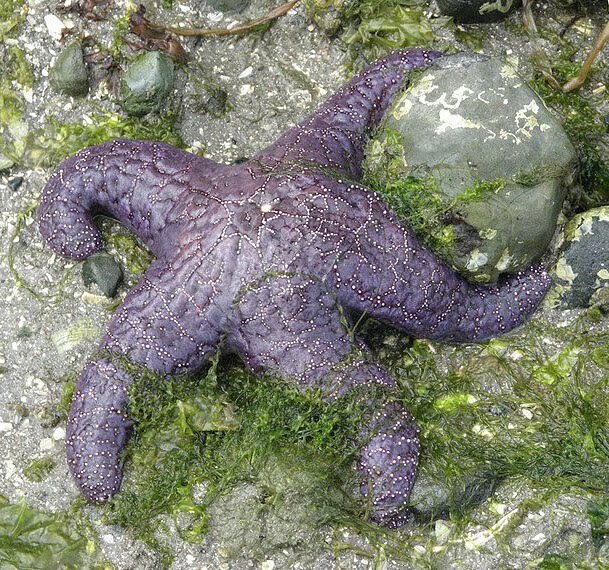 So it's interesting in, say, W. Vancouver where most of the diet is bay mussels, that Pisaster there is still almost 100% purple. Undoubtedly, the issue is not that cut and dry. It sounds like the paper is the start of many projects to come. 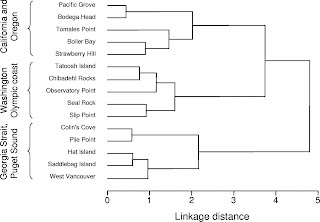 The West Vancouver graph (Fig. 5) shows at least 25 (more like 30-40)% of the food consumed was acorn barnacles.. and they do indicate in the paper that genetic or other factors may be at play. The sampling protocol in the paper outlines that they recorded overall color patterns from the populations over the range. This to me, makes the statistical sampling of color for populations more robust (and thus more representative of the total color in the population)than if done independently from only the individuals sampled, which might not necessarily be as large a sample size. Awesome. Thanks for linking the paper. Now here's a simpler question for you: Where are the little Pisaster ochraceus? Are they subtidal for their first 5 or so years?